Name this character actor (shown here with Dev Anand), who appeared in hundreds of movies throughout three decades of cinema. Sreya is our winner! He is Rashid Khan, and he is ubiquitous in 1950-1960’s movies, especially those with Dev Anand and Shammi Kapoor. I would love to find out more about him/his life if anyone can help. Posted on October 13, 2007 at 10:29 am in Hindi movies, Trivia time	| RSS feed You can skip to the end and leave a reply. I don’t know, but he looks a lot like the very old man who recently played the dying grandfather in Kandukondain Kandukondain. Could it be the same guy? I don’t think so…although I can’t find any biographical information about him at all, so I don’t have any idea if he is still alive. Oh wow, he does look like that guy! Nina, I would never have thought of that. 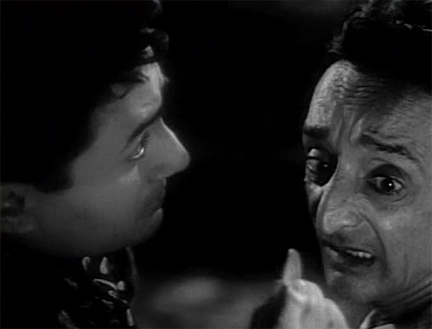 He’s Rashid Khan…a character actor in countless 1950s and 60s flicks. By the way, here’s a great link with names of charcter actors. Yay Sreya! That is a great link, I found it when I was searching for more information about him. There doesn’t seem to be much out there besides his filmography…which is more extensive than noted anywhere too, even on IMDB. Yes, there are so many characters in Hindi films who appear over and over again…over the period of decades, too. Would make a great book.